You’ve done the training. Resist the urge to cram extra workouts in during taper week. Instead, focus on perfecting your game with these 10 essentials—all do-able between now and race day. Then raise your performance an extra notch with the secret tricks veterans forget to tell you. The foundation for a good race starts earlier than you think. Get solid sleep two nights before your race—how well you’ll sleep the night before is always a gamble (tip the scales in your favor: Pack earplugs for away races). And take lunch to the expo. By the time you purchase the water bottle you forgot, decide if it’s bad luck to buy the race shirt before the race, and pay attention to all the other check-in details, lunchtime has come and gone. Pack what you need, and don’t forget water. Staying optimally fueled the day before helps you stay optimally fueled on race day. What no one tells you: Don’t let equipment envy wreck your chi. The two guys next to you at the race talk might have $12K bikes and aero helmets…and also might have plenty more money than training. Go out there and pass them on your $1,200 road bike setup. Wear the same clothes for the whole race. There is nothing about a wet body, a shirt, nervous energy and rushing that goes together well. Tri outfits are Spandex-y, but wearing the same thing for the whole race keeps things streamlined—which means not bunched up or chafed—on race day. One piece or two? One-piece suits don’t have constricting waistbands and won’t leave you with that weird smiley-face sunburn mark from tops that ride up. But two-piece suits win for simplicity when nature calls. What no one tells you: Buy speed laces—elastic laces that let you slip into your running shoes fast. And use a race belt—a simple strip of elastic that your race number attaches to. Just clip it on and go, no pins or fumbling needed. Get to the race site early (not like you were sleeping well, anyway). Some roads have limited access on race day and parking can take forever. The last place you want to spend your energy the morning of the race is stressing about whether you’ll make it to transition and the bathroom before transition closes (usually 15 to 20 minutes before the first wave goes off). Get there early enough to set up your stuff, hit the restrooms three times (no joke), and warm up with a short run and/or swim. What no one tells you: Bring extra fluids and food. Being unprepared for a race delay can tear holes in the most solid of nutrition plans. When you get there, ride your bike before you rack it. Make sure nothing went awry in transit, and leave it in the gear you’ll want to be in when you start. Thank the volunteers. They got up earlier than you did, and they don’t get a medal. One difference between a newbie and a pro is the size of their transition area. The pros have just what they need, right next to their bikes, laid out as carefully as if they were doing brain surgery. Nothing screams newbie (and annoying) as much as buckets to wash your feet in or balloons to mark your spot. Count how many racks you are from swim in and bike in and you’ll find your spot just fine. What no one tells you: Rack your bike by the nose of the saddle, not the handlebars. Your transition area goes by your front wheel, not in back of your bike. If the washing machine of the swim feels like a potential horror show to you, position yourself toward the back of your wave. Hold back for a second or two after everyone has started, then look for a clear spot, pick your line, and swim into it. 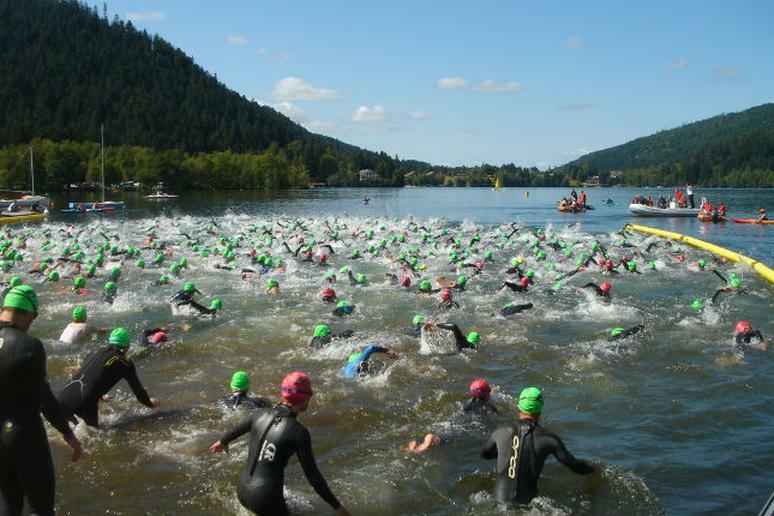 What no one tells you: The law of triathlons dictates that even though there is an entire lake, ocean, or river to swim in, someone will invariably be right on top of you. If they’re truly coming at you in a way that seems dangerous, you can gently (got that? Gently) move them out of your way. Otherwise, look for someone going about your speed and draft off their hips or feet. You wouldn’t be the only one at the race site to wonder why you had thought that getting up at 4:30 (again) to swim, bike, and run with about 1,000 other people—and paying a hefty entry fee for the privilege—was a good idea. Put anxiety in your race plan and you won’t be thrown off when it happens. Also determine what you’ll do about it. Count? Breathe? Figure that out ahead of time. What no one tells you: Find someone who looks more nervous than you and talk them off the ledge. Calms you, too. Goggles fill with water. Flats happen. Always know what your plan B is when the race goes in a different direction than you wanted it to. Triathlon is as much about managing the unexpected as it is about actually racing. How you get through what race day gives you teaches you more than a PR on the bike does. What no one tells you: If you get a flat, be grateful for the opportunity to rest. You wouldn’t be the first one to get a flat and also get on the podium. Don’t burn out by going out too fast. It’s often the smartest person, not the fastest, who wins. You don’t get awards for being the first out of the water and the last off the bike. Plan your energy and strategy accordingly, and don’t let your ego get in the way of sticking to it. What no one tells you: Ironman World Champion Chrissie Wellington says that the sport isn’t swimming, biking and running. It’s triathlon, and a key part of the game is how you put it all together. If you’ve done everything right, it’s going to hurt at the end. Put that in the plan. What no one tells you: Don’t fight it. Embrace it. 3. It’s usually pretty fun, anyway.